They say the early bird gets the worm, if that is true, my son has a buckets of worms. He is an early riser and it is a challenge to keep him from waking everyone else up and some unearthly hour of the morning. 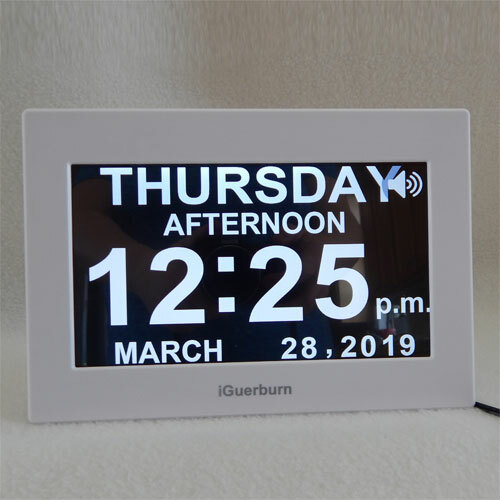 The “iGuerburn Talking Touchscreen Alarm Clock” with it’s large talking display lets him tell the time so he knows if it’s “time to make noise yet”. 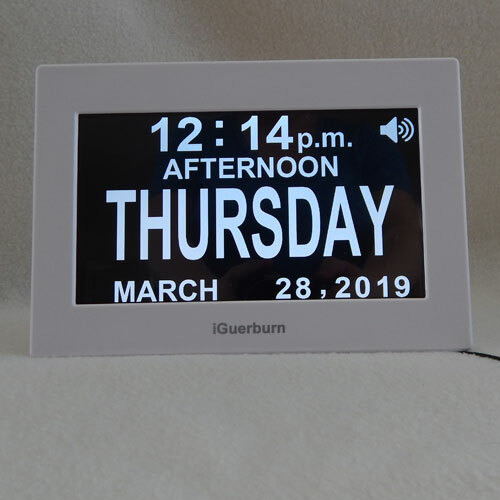 This clock has a large display that can be changed between two display modes. You can choose between having the time or the day as the largest text on the screen. Touch the screen to have it tell you the day and time. The voice speaks slowly and clearly so that it can be easily understood. You must press the upper right of the screen to have the voice speak. This can be difficult to find and press, especially if you have vision or dexterity issues. I love that it offers different languages. I have ours set to US English. When I changed it to UK English, I was surprised to hear that it actually speaks with a British accent. My children have been learning their days of the week and times in French and are delighted to learn that they can change the language to French as well. Pressing the left side of the screen will bring up the brightness option. Pressing the menu the right side of the TV will bring up the rest of the options: Language, Display Mode, Set Date, Date Mode, Set Time, Part of the Day, Set Alarm, Time Format, Background, Font Color, Touch Test and Firmware Version. The clock is quite bright even when adjusted to it’s darkest setting. Keep it at it’s brightest and you can use it as a nightlight. 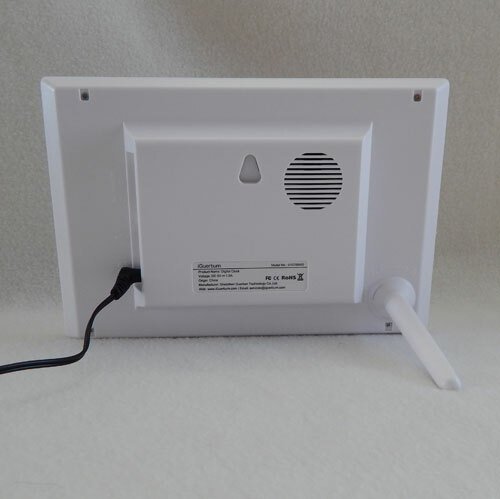 The speaker is located on the back of the clock, so be sure you place it in a location that it won’t be muffled. The volume is adjusted by pressing the speaker icon on the upper right of the screen. The adjusting of the volume can be tricky as you have to press a specific place, which may not be ideal for all users. The leg is on the back to hold the clock up, or you can use the hanger on the back. 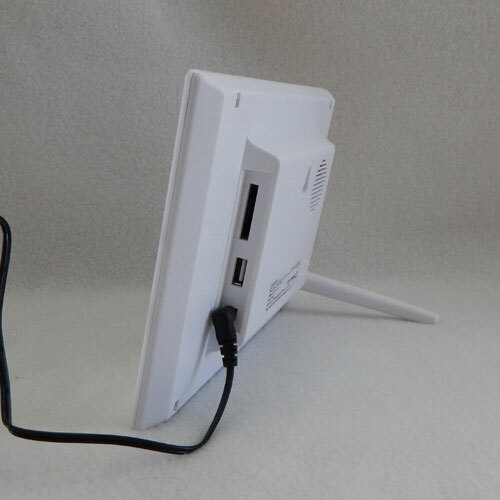 The side of the alarm clock has an SD card slot and a USB slot. 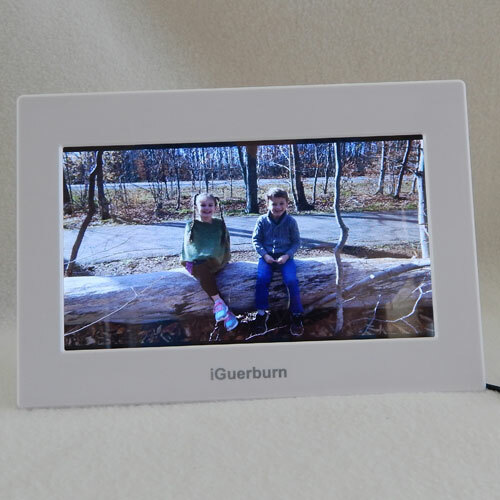 The “iGuerburn Talking Touchscreen Alarm Clock” can also work as a picture frame. Put your favourite images on a USB Stick or SD card and it will automatically detect them. The clock will rotate through your images. Set up to 8 alarms. For each alarm you can choose for it to be a medication reminder or not. There is no way to specify which medication you are to take. To turn off the reminder simply touch the screen. Make this clock your own by customizing the clock to your liking. Change the font, background colour, time format and display. You can set when morning, afternoon, evening and night time are displayed. This is my favourite feature of the clock. When it says morning, my son can easily tell that he is allowed to be out of bed and making noise. This is easier for him than trying to figure out what the numbers mean. This clock has been designed for the elderly, visually impaired and those suffering from dementia. None of these words appear on the clock, packaging or instructions, making it an excellent gift choice. 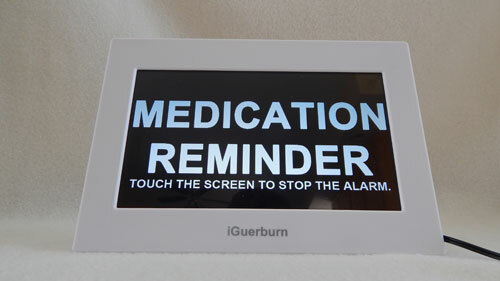 The “iGuerburn Talking Touchscreen Alarm Clock” is a great addition to my son’s room. The large display and touch screen capabilities allow him to easily hear and see the time. *Disclosure: I received a complimentary “iGuerburn Talking Touchscreen Alarm Clock” through the Amazon Vine Program in exchange for my review. All opinions are 100% my own.